Google Analytics is an excellent service to keep statistical records of any website. You can keep track of daily visitors, pageviews, search keywords brining traffic to your website. Ideally, one can access analytics data in web browser by logging into your account at Google Analytics website. Now you can access and keep track of Google analytics data on the desktop using application Polaris. It is an Adobe Air powered application that show 8 standard reports on the fly. After the install, you can quickly access Analytics data on your desktop in very cool looking interface. Standard reports display basic and most important information like visits, bounce rate, pageviews, avg time on site, new visitors etc. 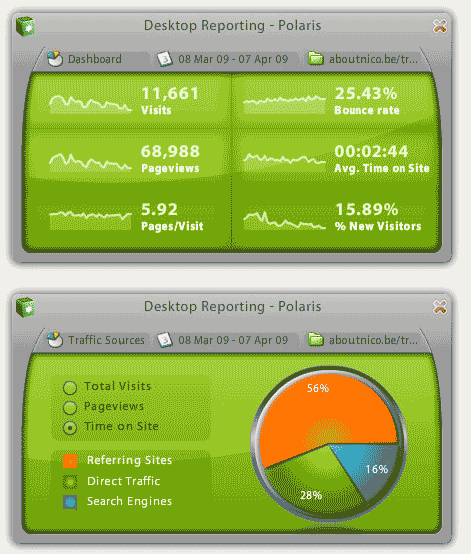 Download Polaris [website – Adobe Air], it is all free for accessing analytics data of one website. Pro version is available for Google Analytics profile with multiple websites. It provides quick access to analytics data on desktop in cool looking stylized interface!